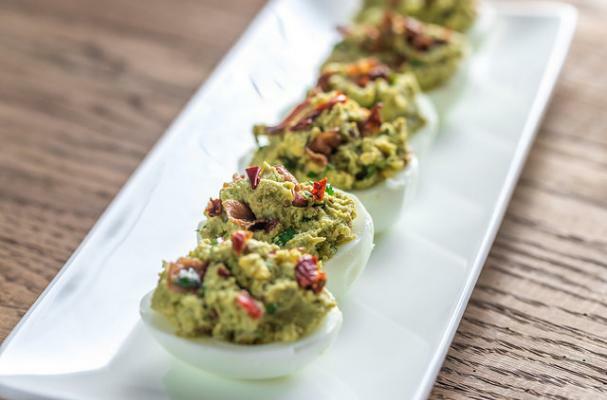 Turn your regular deviled eggs recipe into something even more magical by adding flavorful sun-dried tomatoes. Sour cream and white wine vinegar is combined with mayonnaise and minced sun-dried tomatoes to make a filling that packs a delectable punch! Finely chopped fresh parsley leaves for garnish if desired. Step 1. Halve the eggs lengthwise; force the yolks through a sieve into a bowl. Step 2. Stir in the minced tomatoes, the mayonnaise, the sour cream, the vinegar, and salt and pepper to taste. Step 3. Transfer the filling to a pastry bag fitted with a 1/2-inch decorative tip and pipe it into the egg-white halves, mounding it. Step 4. Garnish the stuffed eggs with 2 reserved sun-dried tomatoes, cut into julienne strips, and the parsley.